Floor coating serves as thin protective layers on existing floors as part of concrete refinishing and as thicker complete flooring systems. The most common resin flooring for concrete on the market is polyurethane and epoxy based resin floor coatings which both come with unique properties. Wooden floors can also be coated, as we cover later in this article. 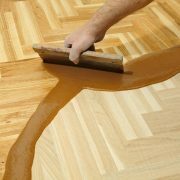 Cost efficient: Can postpone the need for a new floor, complete floor coating systems are durable and easy to maintain. Hygienic: The seamless layer prevents spread and growth of mould, bacteria and fungi. Decorative: Available in nearly all RAL colors and in finishes from ultra matt to high gloss. Applicable in every sector: There is a suitable floor coating for every environment. Functional additives: It is possible make floors anti slip or fire retardant by using the right additives. There are floor coatings suitable for almost any floor, but how to determine which coating is the best for your project? 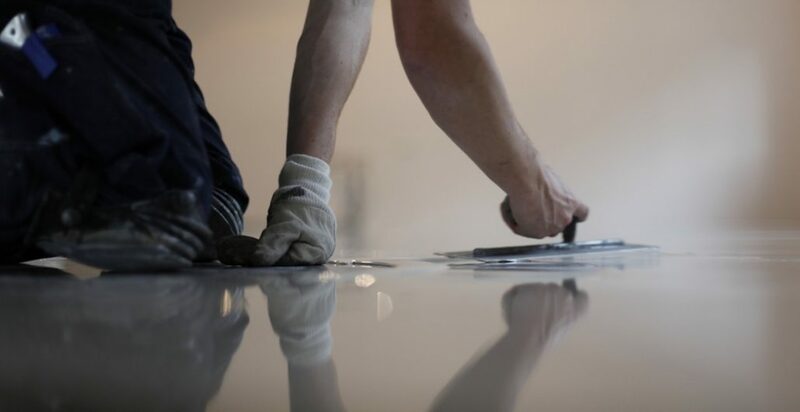 In this article we will provide you with professional advice on choosing the right floor coating for a specified environment. As every environment is different, it is crucial to choose a floor coating that matches the requirements of your specific location. Industrial floors need to bear heavy loads, and commercial floors should feel fine to walk on. A few of the most important factors to consider include downtime during installation, hygiene requirements, presence of chemicals, and people or machines using the floor. Industrial kitchens, for example, require a HACCP certified coating to meet strict hygiene standards. Where downtime is to be avoided a fast-laid solution, such as SolidLux Instant Coating, is an option to consider. Therefore, before you jump into looking for floor coating products you should define what is expected from the coated floor. A wooden floor can be protected with floor coating like varnish, oil or lacquer. Oil, stain and lacquer are perfect solutions for protecting a wooden floor, such as parquet, while letting it retain its natural beauty. Oil is transparent and enhances the natural colors of wood. Stain is absorbed by the wood resulting in a light, semi transparent colored finish. Stains also provide protection from moisture and UV radiation, which makes them suitable for exterior wood such as decking. Lacquer provides a transparent high gloss film on wooden floors. There are also pigmented lacquers which provide the floor with an opaque color finish. Polyurethane resins are protective and hard-wearing. Epoxy floor coating is an extremely hard-wearing solution which relies on epoxy resins. The coatings result in a seamless surface resistant to liquids and dirt, which makes them easy to clean. Epoxy resin flooring bears heavy mechanical loads and does not abrade as a result of foot or vehicle traffic. Instant floor coatings are innovative flooring solutions for floors that should be coated with the absolute minimum downtime. The instant floor coatings do not need time for drying, as they are cured by UV radiation. SolidLux Instant floor coating is the only such product on the US market at the moment. Polyurethane coatings are more flexible than epoxies, which makes them softer and more pleasant to walk on. These coatings are also known for their decorative properties; not only are they available in many colors but they also provide a high gloss finish. Also these coatings are easy to clean due to the fact that they are somewhat resistant to contaminants. Floor coatings with an internationally recognised HACCP certificate contribute to a hygienic, anti bacterial environment; these coatings make sure that fungi and bacteria do not have a chance to attach to and grow on the floor. The HACCP floors are also highly resistant to contaminants and aggressive cleaning chemicals. In the US, HACCP products are mandatory for sectors that process food. Depending on the requirements for the floor, the coating can be complemented with a top coat that gives the floor additional properties. This is mainly to provide additional safety and protection. A top coat is suitable on any of the aforementioned coatings apart from the wooden floor coatings. However, the top coat must also meet the required standards: a restaurant floor still must be hygienic, a factory floor must not wear easily and a commercial floor should remain pleasant to walk on. If it is in the sun, it needs UV stability like polyaspartic coating. The functions a top coat may have include: anti slip for where additional grip is needed, fire resistance to minimise fire hazard, and anti static where electronic machines may cause short circuits. It is also possible to achieve a special effect with a top coat, for example luminous paint can be used to illuminate escape routes. Note that if you are opting for a completely new resin flooring system, these properties can also be created by incorporating additives into the actual floor coating. In that case an additional top coat is not needed. Always opt for a tailored floor coating solution; provide the contractor with as many details as possible in order to achieve the most suitable floor coating. In case you need any consultancy in choosing a floor coating or you wish to reach suppliers of a specific coating, do not hesitate to contact us. We are happy to help! Scratch sensitive epoxy: Epoxy resin flooring is a hard wearing and impact resistant coating, but it lacks scratch resistance. When using epoxy floor coating, it is wise to apply a polyurethane top coat to increase scratch resistance. Application process is time consuming: Concrete refinishing is an investment of your money and time. The flooring application is a specialist job and can last several days, with some exceptions. If there is no time for application an instant coating is a good choice. Bear in mind that even instant coating requires a well prepared substrate. Layer thickness and surface preparation: The thicker the floor coating layer, the more preparation the substrate requires. The usual requirements include a completely clean surface, even surface structure and proper use of primers. Unless you are looking for a self smoothing epoxy coating, which is also applicable on uneven and damaged concrete floors. Pricing and durability: Thin film floor coatings are affordable, however, in the long-term they lack durability. Thicker layer floor coatings are very durable and do not require much maintenance, but they are more expensive in terms of material and application. The larger the surface, the lower the floor coating price per sq. ft: Small surfaces are usually relatively expensive to coat. Type of coating: Epoxy is generally cheaper than polyurethane. Different standards apply to HACCP and Solidlux. Pre-cleaning: Some surfaces, such as concrete, require intensive pre-cleaning and surface preparation. Moisture content on the surface: The moisture content of the substrate may not exceed 3% for optimum results. Cheap may turn out expensive: Ask carefully for the quality of raw materials, they determine the durability of the floor coating. So you have in mind to update a cold room with a hygienic HACCP coating, a parking garage with a epoxy floor coating, a car showroom with a warm PU floor or something completely different. We at CoatingPaint.com are happy to offer our services to provide you with a concrete refinishing, floor coating solution. In cooperation with our coating partners we can make you a competitive proposal for both material and application of floor coatings.